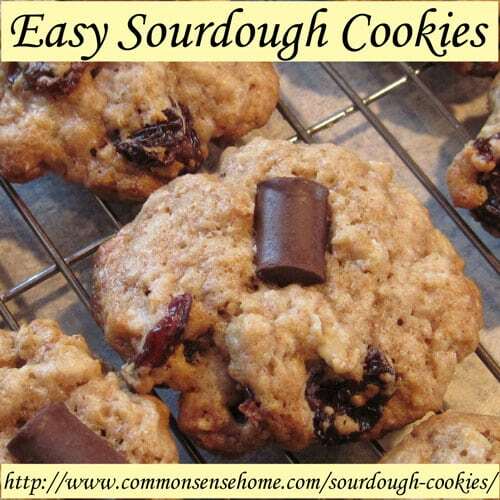 Yes – you can make sourdough cookies that even the kids will enjoy. (They don't taste too sour – honest.) 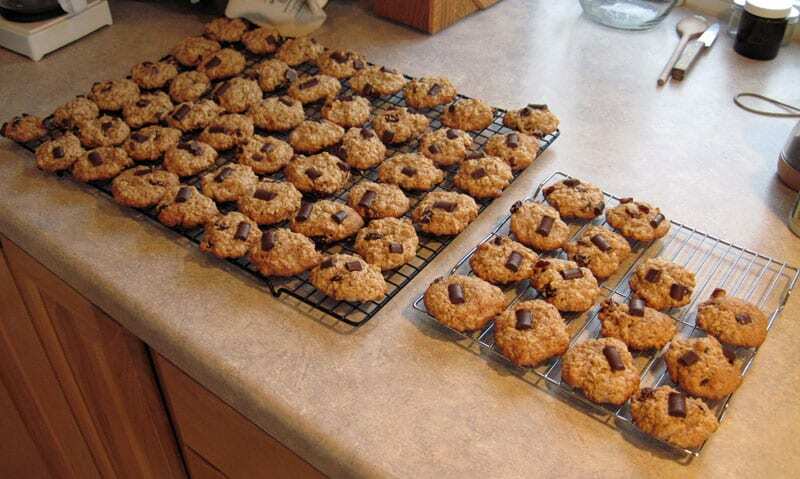 The ones I make generally include chocolate, but you can make them as oatmeal raisin cookies, spice cookies, peanut butter cookies or whatever flavor you like. This recipe is adapted from the GNOWFGLINS Sourdough from A to Z e-book, my sourdough bible. I can't recommend this book strongly enough. I share a couple of variations of the cookies here, the e-book includes several others such as peanut butter chocolate chip and molasses ginger. The book also includes how to start your own sourdough starter, dozens of recipes, gluten free sourdough and so much more. Tortillas, cakes, breads, muffins, cinnamon tolls, crackers, pizza, pasta (yes – sourdough pasta), donuts, biscuits, scones – you name it, they probably have a sourdough version in this book. You'll want to prep this at night to bake the next morning, or prep first thing in the morning to bake later in the day, to allow the sourdough to work it's magic fermenting power on the flour. In a medium sized bowl (I like to use my 8 cup pyrex measuring cup), mix together sourdough starter and butter. (I use salted butter, the original recipe called for unsalted – your choice.) You can use sourdough starter that is more or less active because of the additional leavening agents. Add one cup of flour. Mix well. Continue adding flour a little at a time, mixing well after each addition, until you get a very stiff dough. 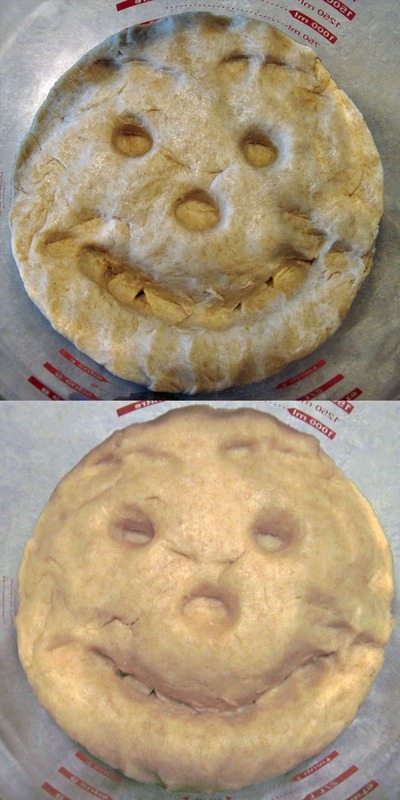 Cover and allow to sour at room temperature for 8 or more hours. Remember, the longer it sits, the more sour it will get. 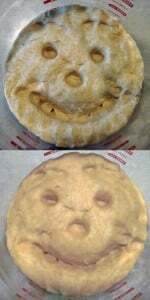 The photos below show the basic dough before and after souring. It gets a little puffy, but doesn't raise like bread. Preheat your oven to 375 degrees F and get your pans ready. These will be a little sticky, so you should either grease or use parchment paper. Mix egg, sugar, vanilla, sea salt and baking powder in a small bowl. (Hold the baking soda for a bit.) Pour this mixture over the top of your soured dough. Blend well (I use my hands). When dough is well mixed, add chocolate, fruit, etc, blend thoroughly. Lastly, sprinkle the baking soda over the top and mix well. Drop by spoonfuls onto a cookie sheet. Bake for 10 to 12 minutes, until bottoms are lightly brown and tops are soft set. Cool on a wire rack. Store in an airtight container with wax paper between layers. Makes around 2-3 dozen cookies, depending on the size. Proceed as above, but add in oats along with the flour before souring. I purchased my sourdough starter from Cultures for Health. (I have the Alaska starter.) You may also catch/grow your own starter, but I've heard mixed results from friends who have tried it. Either way, using sourdough is a great way to get more nutrition out of your baked goods. P.S. – Don't forget to check out Wardeh's book, The Complete Idiot's Guide to Fermenting Foods. I baked some of these last night – the oatmeal version with chocolate chunks, but sans raisins. Initially, I didn’t think I liked them, but later decided I was just too full from supper to enjoy them. Tried one this morning with coffee and it was wonderful!! FYI – I made one pan with my small cookie scoop and one with my medium scoop. Smaller is the better idea. The weight of the medium cookies causes them to break and crumble when you try to pick them up. I usually use an old cookies scooper that belonged to my husband’s grandmother that is around the size of teaspoon. thanks for sharing your experience. I agree – they make great coffee cookies. These are sooo good!!! I made with oatmeal, raisens and chocolate chipsI’ve been trying to use more gelatin to for the last sheet of them I dumped a bunch in and mixed it up.. They haven’t cooled completely but they seem to taste just as good as the others. Also I used fresh ground and sifted einkorn so it took a little extra flour to get a stiff dough. These are still my favorite cookie recipe! I really need to buy wardies book. How to you adjust the recipe to make these peanut butter or spice cookies? Thanks! When I asked Wardee’s permission to share the cookie recipe, I promised that I wouldn’t share all her recipe secrets from the book, since she doesn’t have these recipes printed online anywhere. 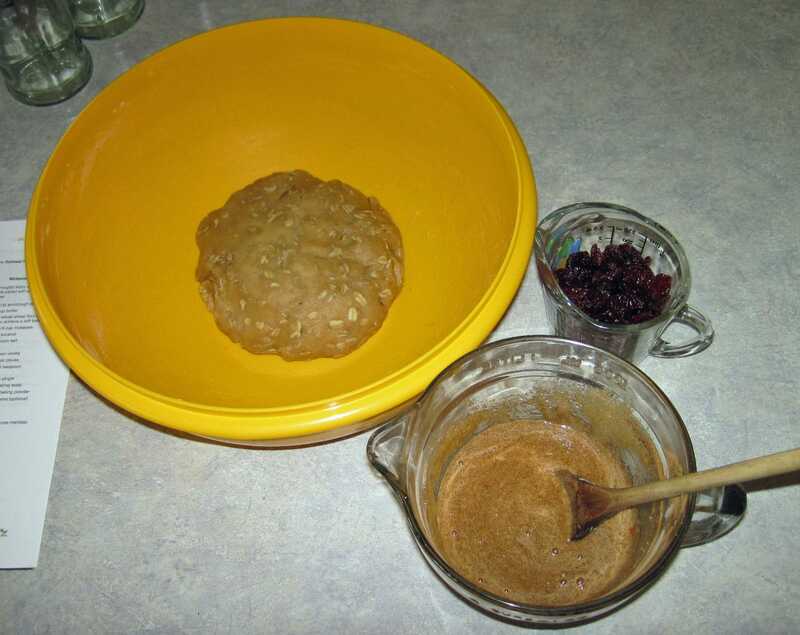 You can experiment and use your imagination, or the e-book includes oatmeal raisin, peanut butter chocolate chip and molasses ginger variations. Mine went very flat and crumbly. What did I do wrong? I use light spelt and a bit of rye flour in my sourdough starter. I’m new to sourdough baking and thought these cookies looked so good! My dough seemed quite firm when I first mixed it to ferment but after it sat overnight and I added the rest of the ingredients it was really soft….any help would be great! Thanks! I haven’t baked with spelt yet, so I’m not quite sure how it behaves, but that may be the difference. Spelt and rye are both lower in gluten, which helps hold the cookies together. When I have it ready to ferment, it’s a very stiff dough – about play dough consistency. These were really delightful. I added some cinnamon to the first recipe and was planning on rolling the dough into balls and coating them with cinnamon sugar. The dough was way too wet for that so I just scooped them into mounds and dusted them with the cinnamon sugar instead. I was surprised how tasty these were, and I will definitely be making them again. They were just the right amount of sweet without being overpowering. Glad that you enjoyed the recipe. Can I eliminate baking soda and baking powder? Baking soda and baking powder help the cookies to rise. I wanted to say the smiley face is sooo cute! So I am looking into sourdough much more because it is actually good for your body and I know a few people who have gluten issues. I have heard many people who are gluten intolerant can actually consume sourdough products with little issue. Do you think they could possibly eat these cookies? I am wanting to bring some of these to church so this one lady who is gluten intolerant can try. If it’s just a gluten sensitivity, then sourdough may be okay. If it’s a true gluten allergy (celiac), then even sourdough is a no-go.